It’s February 2018. The depths of winter; the coldest month of the year. In Russia, we’d have been bundling up in layer after layer to stay warm. In Utah, we’d have been scraping ice off the Volvo windshield before we could go anywhere. In the hills of Malaysia, on the other hand, we are sporting T-shirts and we have hoodies and rain jackets, just in case it rains. The Cameron Highlands reach almost a mile in elevation above sea level in some places. It may not be icy like Russia or Utah, but it is relatively cool here, especially in contrast to the sweltering heat of Singapore where we were less than a week ago. We’re staying at a neat B’n’B in Tanah Rata, north up twisting ribbons of pavement from the small town of Brinchang. This region is as multicultural as the rest of Malaysia–there are lots of Indians here, ethnic Malaysians, and Chinese. The guy who runs our B’n’B is named Troji, and he is of mixed Chinese and Japanese descent. He and his family raise flowers, many of which they export to Singapore. This area is Malaysia’s agricultural heart. When Troji welcomed us the night before, he immediately introduced us to “Your new friends,” and sure enough, we hit it off really well with an Australian couple who are also staying at Troji’s place. They’re named Milli and Pasquale, and they’re taking a year to explore the world before settling in Canada. They’re travelers after our own hearts, so it’s great fun to visit with them. Anyhow, we’ve been wanting to get out and explore the Mossy Forest, and today’s the day. Our host has been telling us that it’s easy to get a lift from random strangers. “It’s safe,” he says. “People here will be interested in you; they’ll like to talk to you, so they’ll usually be happy to give you a ride.” We aren’t quite sure about hitchhiking, but after listening to Troji make the case for it repeatedly and hearing from others that it is indeed okay, we figure we’ll give it a try. “I can take you part way to the Mossy Forest,” Troji says. “You can hitchhike from there. No problem.” He drives us in his black, double cab Toyota pickup down the hills into Brinchang, a 15 minute journey, dropping us off at the foot of the deeply potholed lane which branches off and leads up steeply to the Mossy Forest. We’re a bit skeptical of actually getting a ride, and further diminishing our chances of actually getting a lift, Milli and Pasquale are also with us–so whoever would be willing to pick us up has to carry six people. Actually, we are probably the ones diminishing their chances, since there’s only two of them. We stand at the foot of the road watching car after car go motoring past. It’s the Chinese New Year holiday, and tons of folks are on vacation now. A family packed into a Proton sedan smile and wave as we stand with our thumbs lamely sticking in the air. Their car is full of holiday goers, just like all the others. We’re having no luck with this hitchhiking thing. I’m on the verge of saying, “Ok, let’s just walk,” even though it’s a long way up to the Forest. Finally, traffic up the road comes to a halt, so Pasquale goes and asks a pickup truck driver if he can take us all in his truck. He says “Yes,” and we all hop in the bed. Maybe this wasn’t such a bad idea. It’s a jouncy ride up the narrow roadway, and speeds are slow. The driver comes to a stop about half way to our destination. “I’ll go this way,” he says, gesturing down a long gravel driveway to a farm. We jump down and wend our way up the paved road toward the Mossy Forest. Every time a car goes past, we stick out our thumbs. It doesn’t do any good. But that’s alright–we are enjoying chatting with Milli and Pasquale as we go. At one point it starts to sprinkle, so we pull on our jackets. Those make us hot. To one side the mountain rises up, green, verdant. To the other, the hillside falls away and disappears in trees and mist. We walk under an incredible, lush canopy of banana leaves. Huge vines hang down, and Jenia hangs on one to pose for a photo. The drizzle has stopped, so we take our jackets off, and we’re comfortable again, despite being a bit damp around the edges. Check out the size of those ferns! I end up carrying both Turtle, our 4 year old, and Princess, our 2 year old. She’s in the trusty toddler carrier, so she’s easy. Turtle’s just tired of walking, and so I throw him up on top of my shoulders. From time to time a passing car slows and the occupants ogle us and wave. Our journey eventually takes us over some level land, past row after row of greenhouses. Heads of lettuce grow in raised beds. Men are working in the plants, and they acknowledge us with waves. We pause to get our breath. Princess is ready to walk, so I put her down and after that we all walk a bit slower. A few cars drive past, but nobody stops. We arrive at the park’s entrance and do what all good parents do: feed our kids a snack. Truthfully, we’re all ready for a bite at that point. Refueled on bananas, we continue. 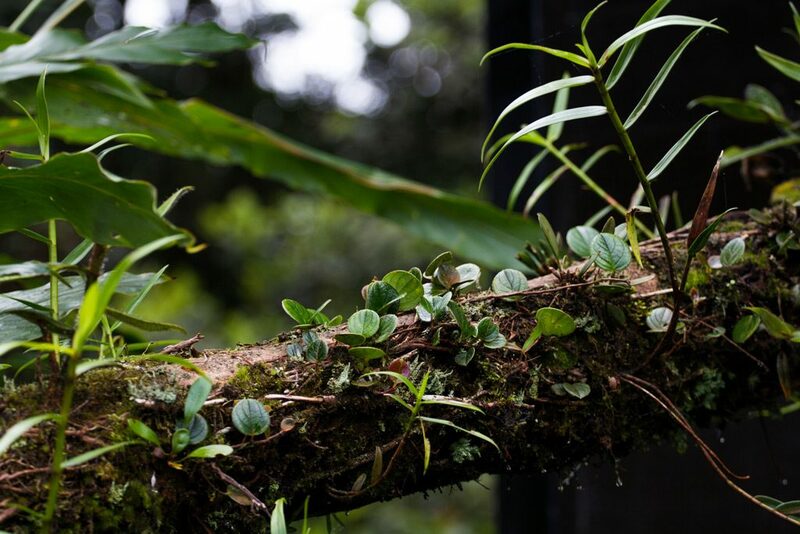 The first part of the Mossy Forest trail is an easy hike along boardwalks with railings. Mist hangs in the air and we’re damp before long. 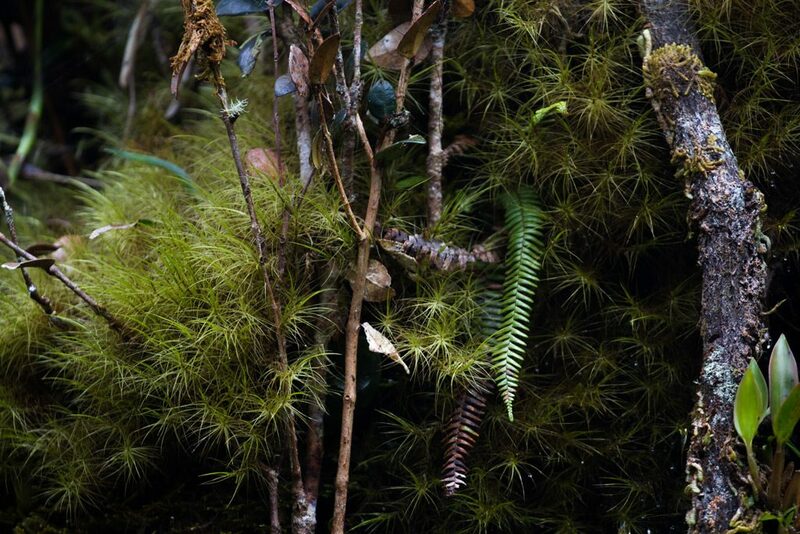 The forest is aptly named, for there are many kinds of moss, all of different shapes and textures. There are large clumps of moss hanging from skinny vines, and the air smells good. “Look at the flytrap,” Pasquale says. There is a Venus flytrap, rather an ugly shade of brown, growing from the side of a heavily mossed tree. A bit higher up the trunk there’s a couple more of the exotic flowers. There is an observation tower that we climb. From up there, it’s obvious that we’re on a ridge, the mountains rolling away to either side. Greenhouses speckle the valley to one side, and the other is uninterrupted foliage. We exchange glances with our new friends and continue on, not at all convinced. 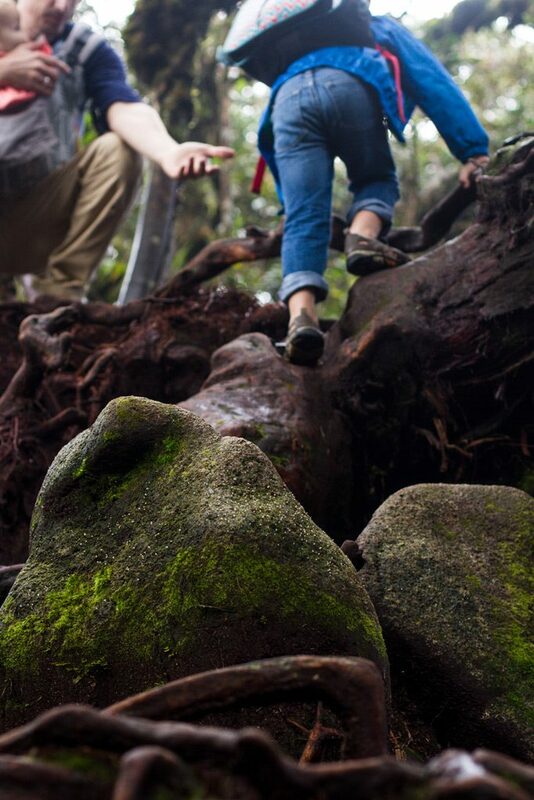 Soon we have to go down a slick hillside, over rocks, around puddles, hanging onto roots so we don’t tumble. We’ve descended into the rain forest. As far as we’re concerned, it’s delightful. We’re careful where we put our hands and feet, for there must be some nasty critters native to the region. 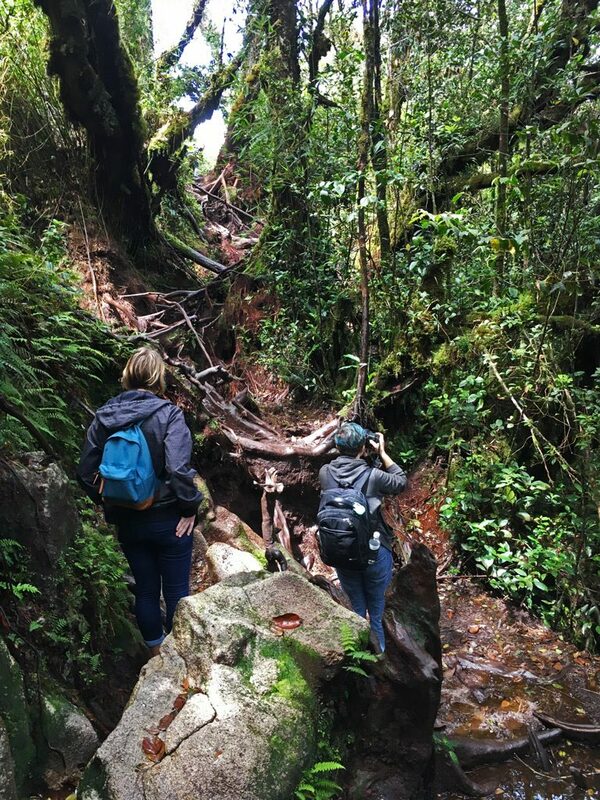 This is a popular route, though, and with lots of people hoofing it through here, chances are good any venomous snakes or evil insects have cleared off by now. Plus, our party of six isn’t exactly quiet, what with the kids in tow. The scenery in here is fantastic. It’s awash with greens of all hues and textures, and of course, moss. The sky is overcast, but that’s common up here. Turtle gets a bit nervous when he suddenly has to urinate. “Oh, daddy, I don’t like this!” I lead him to a place he can relieve himself at the side of the trail, and he is not at all pleased–but he also doesn’t want to wet his pants, so he makes do. Before long, even though the forest beckons further, we decide it’s best for us to turn around, as Turtle and Princess are getting tired. We say bye to Pasquale and Milli, and head back. We are able to observe at least ten different types of moss, even with our non-botanist eyes. We rinse the mud from our shoes the best we can when we get back to the board walk (there is a station set up for this). Turtle isn’t cool with getting wet, but there’s not much we can do about it. This time, back on the lane going downhill, we are having no luck hitching a ride, despite thumbing for one whenever a car rumbles past. “Daddy, why won’t anyone stop to give us a ride?” Turtle asks, his eyebrows furrowed. He’s fussy about having to walk so much. We find a pebble to kick along the pavement for a while, and that does the trick. He’s happy. When the rock gets old, we start tracking objects. “How many can we count?” Eventually he’s on my shoulders, of course, and with Princess in the carrier, I’ll have calves the size of boulders before long. The sun has come out, and it’s hot and we’re drying off quickly. The hoodies are off and it’s beautiful weather for photographs now, with blue skies. We had no idea what we were missing on our way up–the mist has evaporated and we can see stunning scenery that was hidden before. We’re more than half way back to Brinchang when a guy in a pickup hauling produce stops and offers us a ride. We clamber inside and immediately start rolling. “Can you drop us off at BOH Tea Plantation?” We ask. It isn’t far; it’s one of the highlights of the area, and we are looking forward to going there. He says “Okay!” and a moment later he cordially drives right past it. I try telling him again, pointing. “Tea,” he says, “Okay,” continuing to putter downhill. Jenia and I frown at each other. Neither of us feels like walking any distance if we can help it, and the idea of going backward, for BOH is receding in the rearview mirror, is unappealing. Turtle is happy to be in the truck. I shrug and Jenia agrees we can go back to BOH another day. We stop where the lane intersects the main road in Brinchang, where we hopped in a pickup truck earlier, and we tell the farmer he can let us out anywhere here. “Market,” he says with a nod, pointing to the right, the opposite direction from our B’n’B, and then we lurch onto the roadway. We haven’t explored the town, so I don’t mind going that way, but Jenia doesn’t want to go far. Then we come to a halt in traffic. Brinchang’s two-lane road is easily jammed. He smiles and says, “One minute. Market,” gesturing vaguely ahead. Jenia and I exchange glances, but we’re in motion again momentarily. He drives us completely to the other side of town, where there is, indeed, a sprawling market. This is where he’s delivering his veggies. We jump out and I offer to help him unload the cartons, but he smiles and waves us away. Jenia’s nonplussed. We’ve ended up much farther down the road than we wanted, never mind entirely missing the tea plantation. Turtle’s not sure what to think, but the sights intrigue him, and Princess is blithely care free in her carrier. The market turns out to be bustling, with lots of interesting goods for sale, ranging from durian to long, skinny green “stink beans” to boxes of tea, and everything in between. It’s the homemade strawberry ice cream popsicles that get everyone smiling again, though. We leave the market and stroll the sidewalk back toward town, stopping in various shops along the way. Since we’re punctuating our way into Brinchang with frequent stops, it goes reasonably easily, though our feet are feeling it by now. We’ve covered a lot of distance on them. There’s no way we can walk all the way to Tanah Rata. “Let’s get a taxi,” Jenia says. None come along. However, with nary a taxi to be seen, we reluctantly decide to try our luck hitchhiking again. We spend 20 minutes with thumbs out to no avail, although it seems like longer. Then it starts raining. Hard. So we give up and retreat to cover under the porch of a closed restaurant. There’s no way a car is going to stop for us now. We persist a bit longer, a bedraggled family with thumbs protruding from under a porch, before phoning Troji to plead for help. As we’re on the phone with him, he asks us where we are. I read the name of the restaurant on the sign, and describe the curve in the road, and as he says he’ll have someone come get us, a dark colored Toyota pulls into the parking lot and comes toward us. Even though it’s raining, we are so tuckered out that we’re delighted by this turn of events, and Turtle is laughing as he and Jenia huddle against the cab to try to stay out of the rain. Princess is pleased because everyone else is, and proceeds to sing “The Wheels on the Bus” all the way back. When we get back, we find Milli and Pasquale have already returned. They had no trouble getting a ride. Troji acts genuinely surprised that family hitchhiking didn’t work out so well for us. Love this!! Felt like I was right there with you. My first thought was “wonder what types of snakes are there” (we had just been hiking in N Ga mountains and came across a huge copperhead and then returned home after a week of vacation to confront a 6 ft rattler in our yard so venomous reptiles are first and foremost in my little brain right now lol). So what types of venomous snakes are in your area and have you encountered any on your excursions? I especially enjoy reading how your children react and am delighted that you include so much about them!! That’s rather bad luck to cross paths with 2 big, bad snakes like that in quick succession! We haven’t encountered any snakes here, but there are signs warning people to be careful when hiking on the local mountain (there are lots in Shenzhen). Before we moved, I told my dad I was about to do some research on how many poisonous snakes are in the area. He said, “You aren’t going to like what you find.” He was right. There are no less than 35 venomous species in South China (and this also goes for SE Asia in general). They include the cobra and king cobra; the deadly banded and many-banded krait, various pit vipers, something called the keelback, coral snakes, and various sea snakes. Luckily, most snakes are, of course, eager to avoid people. We don’t walk quietly when we explore; as a guy I met in Australia this year said, “Just walk with a heavy foot, and they (snakes) go away.” We also aren’t exactly blazing new trails or anything; the paths we go on are heavily traveled. I’m glad you enjoy reading! More stories to come! Seeing the pictures of the Mossy Forest and listening to your descriptions of the area makes me want to be there. How do you find places to stay in the remote areas you travel to? About how bad is it cost-wise? Well, like I said, I wouldn’t have been hauling the kids into a place that wasn’t busy. If there weren’t other hikers, I’d have been a bit more cautious about taking them. What an experience! I still find hitch hiking quite daunting and dont know if I’d be apt to try lol I feel like in this post i was right along with you! Thanks, Lauren! It was a bit of a letdown and we aren’t sure if/when we’ll try it again! What a vivid journey you take the reader on. I felt like I was holding my thumb out with you and crammed in the taxi with a one of your kids poking me. I love that you met Aussies. We always say it doesn’t matter where we travel we always bump into Aussies. It is the silent worldwide invasion. Aussies everywhere! What an adventure…if you can call it that! 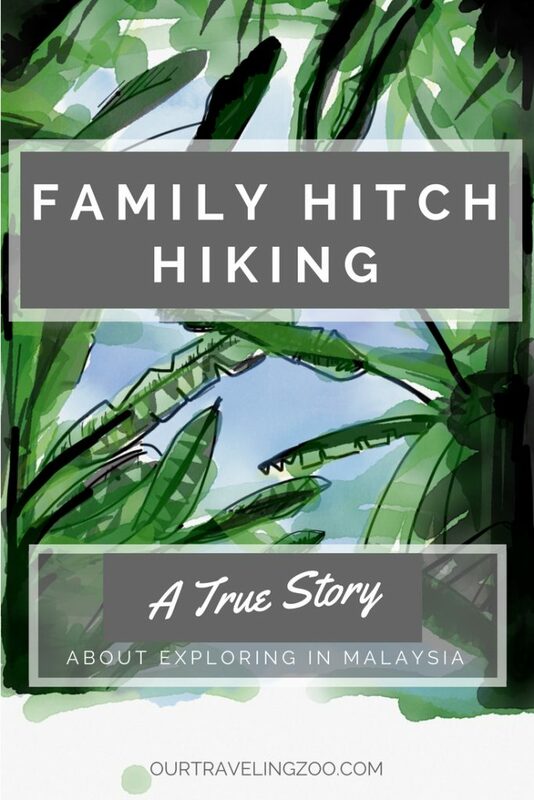 You are brave for hitchhiking as a family – I feel that would be so stressful! It reminds me of our days in Fiji, we used to have a ute with an open tray at the back so we’d just let the hitchhikers jump in the back. It was loads of fun and pretty common there for families to travel. Transport came in many different shapes and forms there! Is that right? What fun! Is Fiji a good place to explore? What a long long day! I don’t think I would ever rely on the idea of hitchhiking since I hate not having a plan. BUT in some situations, recommendations from locals wins out. Glad you found your way back. Thanks, Angela! Even the idea of hitchhiking took some warming up to, but we figured that with several people telling us it would work (and it was safe), we would give it a try. I don’t know that our children would have been as agreeable as yours were. I can hear the grumbling now. “We should never have tried to hitchhike, Dad.” Having said that, I love the journey you took us on. I love the unexpected events, the rain, the mist, the long detour. What a fun adventure to remember years from now. Yeah, Lance, I agree–it was quite a little adventure! The little ones are pretty down with exploring however, so that’s nice. We’ll see how long it lasts! Great story- Love the honest take on how it actually is with kiddos. What an adventure! Yay for the Australians! Thanks, Michelle! What an easy-going, natural narrative style you have! It made a great read. These kind of blog posts are rare, so I really enjoyed it. I could even imagine the expressions of you all. Thanks, Michael! Yeah, the farmer was a really affable guy! I love your storytelling! I totally sympathise with little Turtle…it was a long walk! The forest looks beautiful. I love the moss. Yes, it was a long walk! Our little ones are really troopers, by and large. 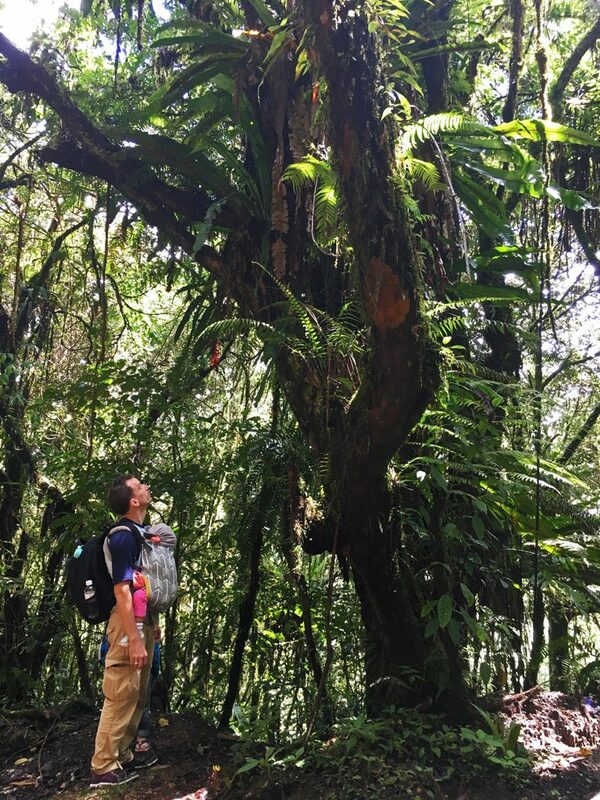 If you are ever in Malaysia, the Mossy Forest is definitely worth hiking. I was not sure to expect when I read the title but what an interesting story. I like that Troji welcomed you as new friends that is always going to start anything off on the right foot. Sounds like it would of been a long walk and what an adventure for your family and story you can share with the kids are older. Thanks, Mel. Yeah, it would have been a long walk, alright! Troji was a great guy, for sure. I’ve hitchhiked in Malaysia a few years ago. We were 3 people then. We managed to get where we wanted, but it wasn’t very easy. It took quite a lot of time. That sounds like it must have been quite an adventure, Kaspars. Our host swore it was the best way to get around, but you could certainly be correct! We had a memorable time at the least!